Apologies if you expected the channel to change after the two greatest split the year’s four majors evenly between themselves. Roger Federer and Rafael Nadal’s enduring dominance, and the inconsistency of their most dangerous threats, have frozen everything in place. The hypothetical Next Generation of men’s tennis did not bring their best to Shanghai this week. 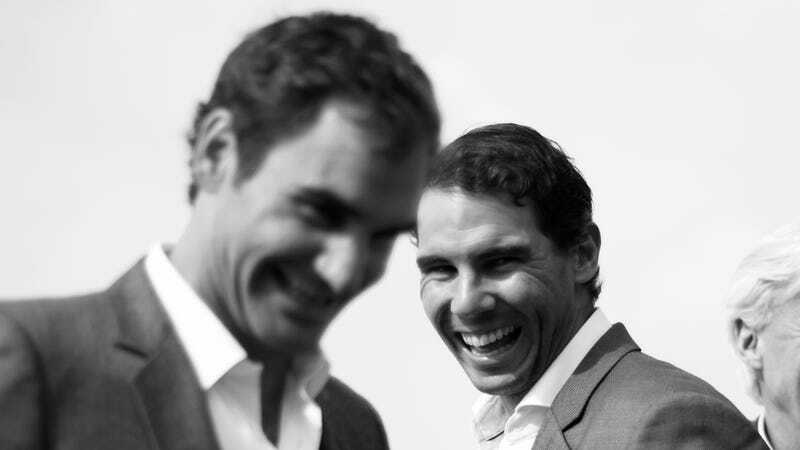 With all those players examining their feet for bullet wounds, Fedal now occupies half of the final four in Shanghai, and the probability is well over half that one of them will take the title. Neither of them advanced by playing mediocre ball—pinch yourself as a reminder of how lucky the sport is to have them both still ticking. Grigor Dimitrov lost in three sets to Nadal, for the second week in a row. Rafa will play against blister-thwarted Wimbledon finalist Marin Cilic in Saturday’s semifinal. For context, the quick cuts in this 29-second video of Federer’s aces only removed about 16 seconds of extraneous time from this ridiculous service game. People on the internet have short attention spans. Men’s tennis has kept it pretty simple for a distracted viewer by ensuring that nearly every title is won by one of two unforgettable names.